We love being inside a National Forest where light pollution is virtually nonexistent. A big reason is that the dark skies make for great stargazing on clear nights. One such opportunity for being star struck — or planet struck as the case may be — was just last night, when Jupiter, Venus and the crescent moon were grouped together. The snow flurries in the morning melted away in the afternoon sun and the skies cleared up for a good show. 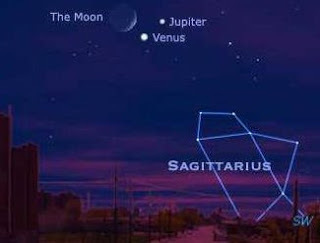 You may have noticed if you recently looked up at the night sky just after sundown, that Jupiter and Venus, the two brightest planets, have been inching closer and closer together. Last night, they were at their closest point and now they start moving away from each other again. The next time this particular conjunction will occur will be March of 2012. Though the planets and moon may seem to be in close proximity to each other, scientists tell us that last night, the the moon was about 251,400 miles from Earth, while Venus was nearly 371 times farther away (93.2 million miles), and Jupiter was almost 2,150 times farther away (540.3 million miles). We’re gearing up for the next celestial show, the Geminids Meteor Shower, which is the most consistent of all the annual meteor showers (in terms of the amount of meteors and the amount of layers needed to keep warm while watching the meteors). The Geminids will be raining down December 13-14, with the opportunity to see 1 to 2 shooting stars per minute at the peak (weather permitting). The peak for Western North Carolina’s viewing of the Geminids will be in the early hours of December 14. Happy stargazing!